15 minutes play...BumbleBeans Inc.: Ochre..
First off, I need to say that Ochre isn't a color I would have thought to fancy! Nor, would I have expected to find so much in my stash which went in that colorway. Thanks so much for this challenge which opened my eyes!! orangey-rust, cranberry and some beautiful green leaves in my stash ... origins unknown. May need to take myself on a search for more yardage of that one (any excuse will do ... no?). Neglected to photo before putting all my scraps away. The border block: strange orientation on this photo, but you get the idea. I've been playing with this for days now and still can't get it exactly as I like. Apparently I don't play well with ochre :(. Maybe too many prints, maybe too much light. In any event, I'm done pulling my hair out on this one. Now off to show orange! 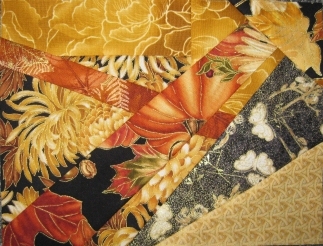 Great fabrics and color combinations! I like the subtleties of the block. 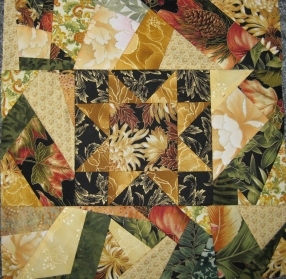 I'm a big one for contrast, but my favorite thing is to throw in some that blend in and out in a quilt... I really like this block! 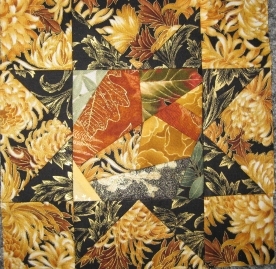 That print with the chrysanthemums is terrific. I like the way these blocks look.